Greenhouse, global warming, climate change, IPCC events, news, articles, mostly from the Internet & email groups, much of which will never find its way to mainstream media. The idea is to post new material as soon as it comes to hand and maybe close off issues each month. Feedback and articles to wazzau2002(at sign)yahoo.com.au please. I trust all the original authors are acknowledged, I have tried to include url's to their sites where available. I have emailed the BoM asking that they either improve their "Outlooks", stop doing them out of respect for hard-working taxpayers or try out 30 day "Outlooks". In reply they say their predictions are worse at 30 days !!! 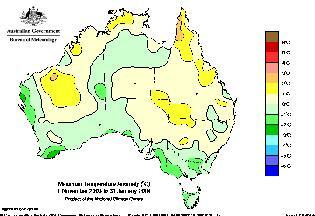 The BoM also produces a parallel series of Rainfall Outlooks, results are just as bad as for temperature. So now whenever you see a media article prattling on about climate modelling for decades into the future, you know they are quoting rubbish. SPECIAL EDITION of Coolwire to review predictive skills of Australian Bureau of Meteorology (BoM). We have all heard our "climatmeisters" predicting how the world will be hotter decades into the future. Let's examine closely how good they are at predicting the real world climate just three months ahead. The BoM publishes monthly a three month rolling "Outlook" prediction of temperature and rainfall probability maps for Australia. A comparison of a series of 30 of the "outlook maps"(prediction) and the real world result from 4 months later demonstrates that the BoM modellers have big problems in getting the Outlooks to resemble the subsequent observations. 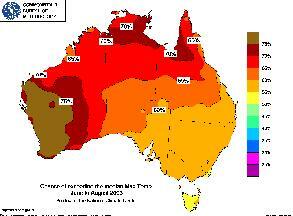 Maximum temperature Outlook Map for October to December 2004 published by BoM mid September 2004. "Increased warmth favoured for much of eastern and southern Australia", says BoM. 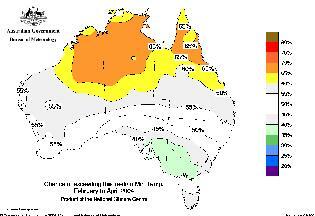 My comments; Additional to the BoM headline there is clearly a predicted slight cool anomaly in northern WA / west NT. 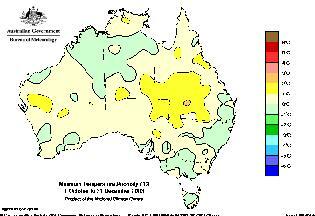 Actual temperature anomaly maps from the BoM four months after the corresponding Outlook and my comments. Observed maximum temperature anomalies October to December 2004, published mid January 2005. Instead of the predicted warm axis across the south as modelled in the September "Outlook" the EXACT OPPOSITE has happened in that the main axis of warming is in the NORTHERN half of the continent, not the SOUTHERN. It gets worse for the BoM because the prediced sl cool anomaly in northern WA / west NT turned out to be part of the MAIN WARM anomaly. 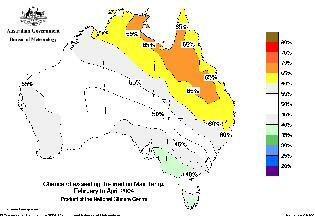 To be fair SW WA and much of SE & E Aust are passable. Maybe a 40% overall. 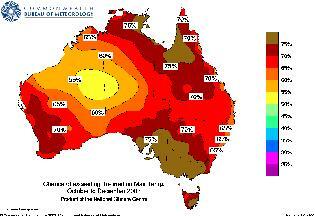 Minimum temperature Outlook Map for October to December 2004 published by BoM mid September 2004. Observed minimum temperature anomalies for October to December 2004. 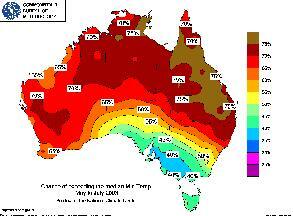 The predicted intense warmth in SW of WA was a failure but the rest of the map is fair. 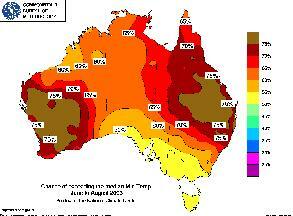 Maximum temperature Outlook Map for September to November 2004 published by BoM mid August 2004. "Warmer than average Spring for south Queensland ", says BoM. Observed maximum temperature anomalies for September to November 2004. Published mid December 2004. The best validation of any Outlook since the March 2003 max temp Outlook, maybe a 65%. 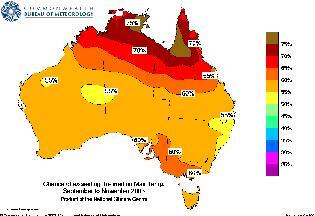 Minimum temperature Outlook Map for September to November 2004 published by BoM mid August 2004. Observed minimum temperature anomalies for September to November 2004. The real world warm axis E - W across the centre was missed by the model as is the cool anomaly in northern WA / NT. SW WA EXACTLY WRONG, but hey !! lets not nit-pick, there have been many worse efforts than this. Observed maximum temperature anomalies for August to October 2004. EXACT OPPOSITE of BoM model in that a warm ridge crosses the continent E-W with cooler or more average areas in far north and SW WA to Vic and Tas. Focus of main warmth is eastern not western as in model, EXACTLY WRONG. Warm areas predicted in far north of model turned out to be main COOL focus. So once again EXACTLY WRONG. 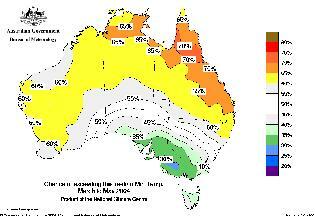 Minimum temperature Outlook Map for August to October 2004 published by BoM mid July 2004. 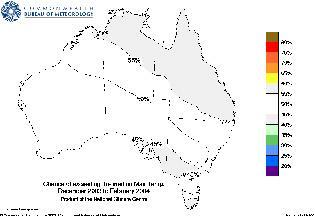 "Increased seasonal warmth for parts of WA and SE Australia", says BoM. My comments; Hot in west, grading to a cooler trough with axis from N WA to Tas, then grading to warm axis through N NT, Qld to N NSW with smaller hotter patches from S Cape York to central E Qld. Observed minimum temperature anomalies for August to October 2004. GENERAL FAILURE again for the BoM. Hot predict for SW WA actually COOLER. Cool result in far north NOT SEEN in model. 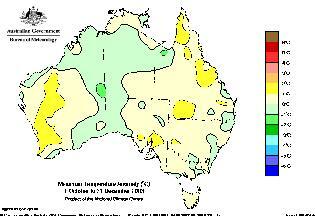 Predicted broad Qld warmth fails to show and S central warm patch not hinted at in model.. 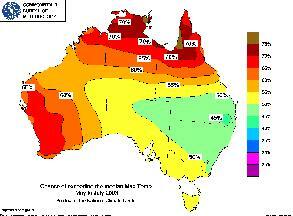 Maximum temperature Outlook Map for July to September 2004 published by BoM mid June 2004. 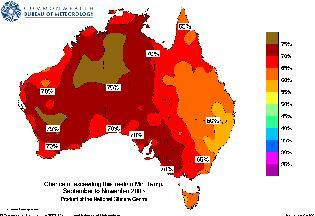 "Above average temperatures more likely in north and west for September quarter", says BoM. 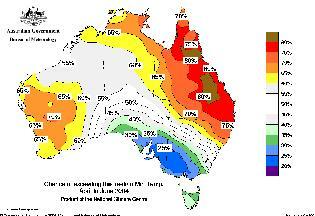 Comments; Hot in west, warm in north a simple predicted gradient to cool south east. Observed maximum temperature anomalies for July to September 2004. TOTAL FAILURE again for the poor old hapless BoM. Actually warm in the EAST and av or coolish elsewhere. 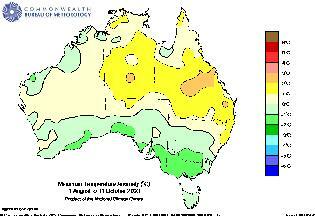 Minimum temperature Outlook Map for July to September 2004 published by BoM mid June 2004. Observed minimum temperature anomalies for July to September 2004. How wrong can you be, ask WA wheatfarmers who experienced frost damage to crops in Sept. 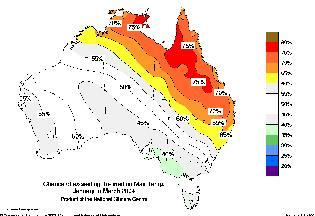 Comments; Hot in west, warm in north a simple predicted gradient to cool south east. Observed maximum temperature anomalies for June to August 2004. Comments; Hot WA prediction TOTAL FAILURE. Extent of northern warmth fails to show, northern cool patches NOT PREDICTED. 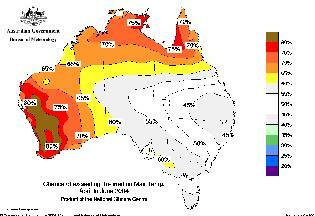 Locus of observed East Aust warmth NOT PREDICTED. 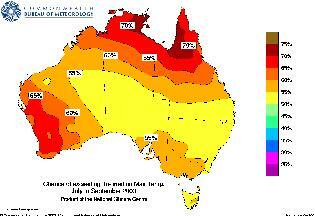 Minimum temperature Outlook Map for June to August 2004 published by BoM mid May 2004. Comments; Hot WA and hot S Qld -N NSW, cooler SA, Vic, Tas. Observed minimum temperature anomalies for June to August 2004. 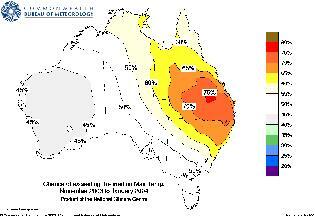 Comments; South Qld -N NSW hot prediction TOTAL FAILURE, actually a COOL area. WA hot prediction TOTAL FAILURE. Northern cool patches TOTAL surprise for modellers. 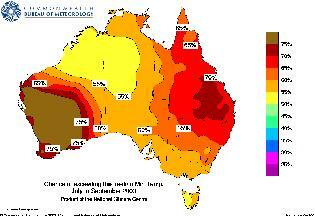 Central Aust warm spot and SA warmth TOTAL surprise for modellers. 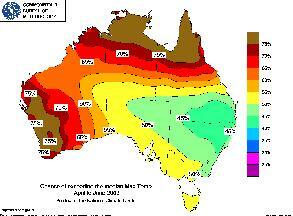 Maximum temperature Outlook Map for May to July 2004 published by BoM mid April 2004. "Cooler in the southeast, warmer in the far north. ", says the BoM. Comments; Except for WA, a simple predicted gradient from the warm north to cool south. Observed maximum temperature anomalies for May to July 2004. Comments; Extent of northern warmth fails to show, S Qld coastal NSW warm peak total surprise for modellers, northern SA cool patch not hinted at in model, N WA cool also not forseen, Vic and Tasmania pretty good. Minimum temperature Outlook Map for May to July 2004 published by BoM mid April 2004. Comments; A warm peak south of the Kimberlies in north WA and warm Cape York grades to a slightly cool Victoria. Observed minimum temperature anomalies for May to July 2004. 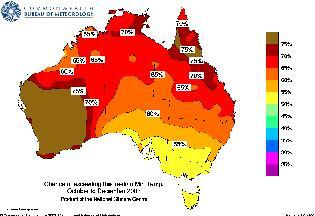 Comments; Extent of top end warmth fails to show. So total failure there. Warm peak is actually around Ayres Rock, a mere 500 km away from predicted location. 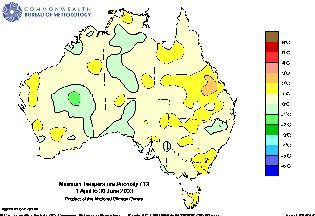 Peak cool anomaly in S Qld NE NSW not hinted at in model, so more TOTAL FAILURE there. VIC to south SA fair. Tasmania fair. 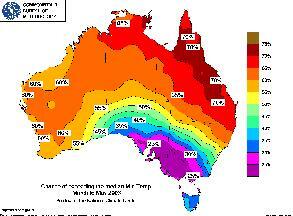 Maximum temperature Outlook Map for April to June 2004 published by BoM mid March 2004. Comments; An east plunging cool trough extends from Broome thru Brisbane, with warmth in the Top End and Southern WA. 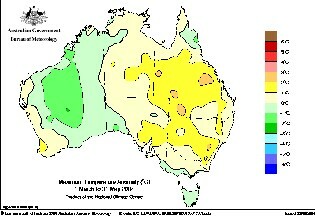 Observed maximum temperature anomalies for April to June 2004. Comments; If there is a cool axis it runs N/S from Eucla to the Kimberly's. So total failure there. 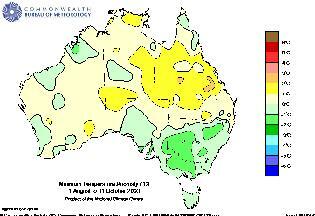 Dominant feature is warm patch in S Qld, EXACTLY where the model predicts greatest cool, so more TOTAL FAILURE there. SW WA patial win, VIC to south SA coastal cool v wrong. York Peninsular exactly wrong, Tasmania wrong again. Observed minimum temperature anomalies for April to June 2004. Dominant feature is warm centre, model 90% failed there. SW WA wrong, coastal Qld predicted warmth failed to arrive, NE NSW cool patch totally unpredicted in model. West Vic passable, Tasmania partial success at last. Observed maximum temperature anomalies for March to May 2004. Comments; The cool axis is NS thru inland WA. 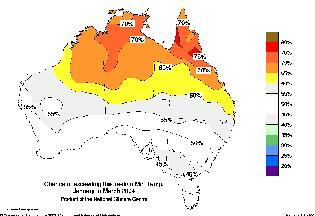 Predicted warmth near Weipa fails to show. Whole sense of Qld-NSW warnth was not picked in model, no NS gradient. S Vic Ok and Tas good. 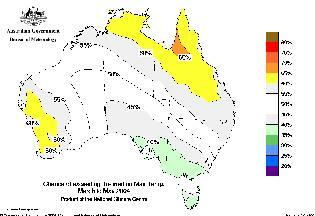 Minimum temperature Outlook Map for March to May 2004 published by BoM 17, February 2004. Comments; Gradient from N to S in east. Observed minimum temperature anomalies for March to May 2004. Comments: SA Vic OK, S WA exactly wrong, no sign of predicted warm Cape York to Qld coast. Tas OK. Warm high east of centre not predicted. 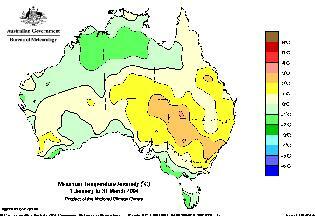 Maximum temperature Outlook Map for February to April 2004 published by BoM 15, January 2004. Comments; there are two main features here , a warm axis extending SE from Darwin and a cool axis extending NW from Tasmania. Observed maximum temperature anomalies for February to April 2004. Comments the warm axis is displaced about 1000 km to the SW and the cool axis flexes through 90 degrees. Hardly a ringing success. Minimum temperature Outlook Map for February to April 2004 published by BoM 15, January 2004. Comments; there are two main features here , a warm patch in the top end and a cool area around western Victoria. Observed minimum temperature anomalies for February to April 2004. Comments: The warm patch in top end is displaced to centre of continent but the cool area over western Victoria is v good. Maximum temperature Outlook Map for January to March 2004 published by BoM 16 December 2003 Comments; there are two main features here , a warm axis extending SE from Darwin and a cool axis extending NW from Tasmania. Observed maximum temperature anomalies for January to March 2004. Comments: The huge cool patch in NT north WA was not forseen. The predicted warm patch in top end is displaced to SE of continent but the cool area over southern & western Victoria is v good. 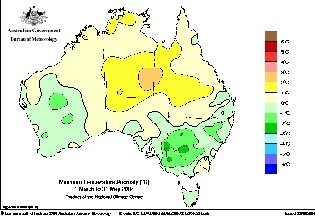 Minimum temperature Outlook Map for January to March 2004 published by BoM 16, December 2003 Comments;The main feature, a warm top end. Observed minimum temperature anomalies for January to March 2004. Comments: The warmth predicted for top end actually happened in the centre. Top end is actually average to cool, the cool area over western Victoria is much deeper than hinted at in the "Outlook" which only showed a cooling gradient. Maximum temperature Outlook Map for December to February 2004 published by BoM 14 November 2003 Comments;How any savvy scientific group could put out an "outlook" like this is beyond my ken. How often has Australia produced three monthly observations as flat as this ? Observed maximum temperature anomalies for December to February 2004. Comments: The "Outlook" prediction completely missed the two main observed features. 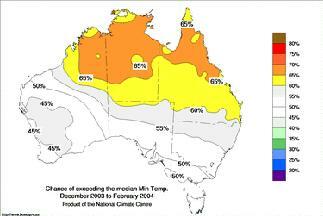 Minimum temperature Outlook Map for December to February 2004 published by BoM 14, November 2003. Comments; The warm top end dominates this "Outlook". Observed minimum temperature anomalies for December to February 2004 . Comments: The warm patch in top end is displaced to centre of continent and replaced by a cool anomaly. Could any result be as wrong ? The cool in Victoria was not hinted at in the "Outlook". 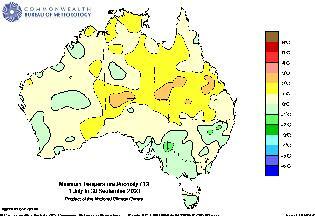 Maximum temperature Outlook Map for November to January 2004 published by BoM 16 October 2003 Comments;Simple pattern, warm over SE Qld, steady cooler gradient to west. Observed maximum temperature anomalies for November to January 2004. 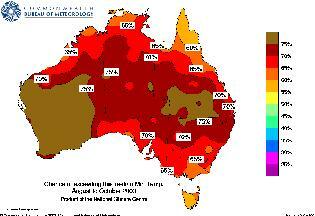 Comments: Some points for general Qld warmth but missed Cape York, Pilbara and and the cooler coast from west to Vic. Minimum temperature Outlook Map for November to January 2004 published by BoM 16 October 2003 Comments;Simple pattern, warm over coastal N Qld to Cape York, cooler gradient to west. Observed minimum temperature anomalies for November to January 2004. Comments: Nothing like the "Outlook" which completely missed the location of the mild warm axis thru centre and cooler SW WA and SA-Vic. Maximum temperature Outlook Map for October to December 2003 published by BoM 16 September 2003 Comments; Prominently much above average, extreme warm over Top End and S SA-Vic. Observed maximum temperature anomalies for October to December 2003 . Comments: Turned out markedly cooler. Some marks for S WA pattern if not magnitude, ditto central WA relatively cooler. V poor result for Eastern states. Minimum temperature Outlook Map for October to December 2003 published by BoM 16 September 2003 Comments;Model on steroids, major overall warmth predicted. 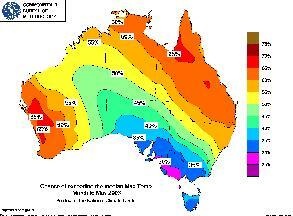 Maximum temperature Outlook Map for September to November 2003 published by BoM 19 August 2003. Comments; Extreme warm over Top End and warm S SA-Vic. Observed maximum temperature anomalies for September to November 2003. Comments: Some points for general Qld warmth but predicted Cape York extreme warmth missed the bus. S SA and Vic exactly wrong as is Tas. 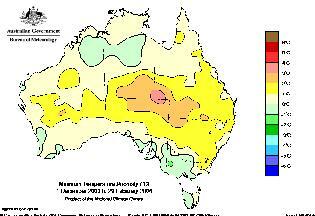 Minimum temperature Outlook Map for September to November 2003 published by BoM 19 August 2003. Comments;Model on steroids again, major overall warmth predicted. Observed minimum temperature anomalies for September to November 2003. Comments: How many times does the model predict too warm overall before they learn ? The patterns are so much at odds with prediction that you have to ask, what is the use ? 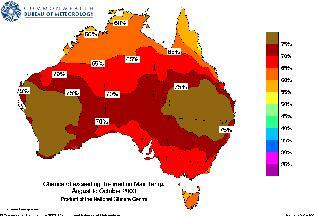 Maximum temperature Outlook Map for August to October 2003 published by BoM 16 July 2003. Comments; Prominently much above average, extreme warm over S WA and S Qld N NSW. Observed maximum temperature anomalies for August to October 2003. Comments: Huge loss of points for turning out near average overall. Some points for general Qld warmth. The model totally missed cooler Pilbara and the prominently cooler coast from west to Vic. S WA NOT hot. Tas wrong again. 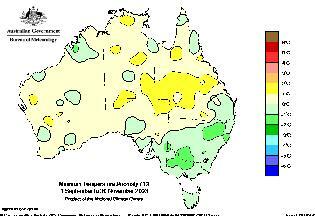 Minimum temperature Outlook Map for August to October 2003 published by BoM 16 July 2003. Comments;Model on steroids again, major overall warmth predicted and that dipole effect persists. Observed minimum temperature anomalies for August to October 2003. 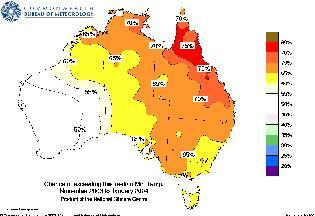 Comments: The warm patch in Qld is not where model predicted but worth 60% for Qld say. S WA NOT hot again ? Vic NSW cool not predicted. Tas wrong again. Maximum temperature Outlook Map for July to September 2003 published by BoM 17 June 2003. Comments; Above average overall again, extreme warm over Top End. East plunging cooler trough extends thru NSW. Observed maximum temperature anomalies for July to September 2003. Comments: No 1, real world NOT as overall warm as model. No 2, real world acrually has a warm RIDGE EW thru centre while model had a TROUGH. Some points for general Qld warmth but missed Cape York, Pilbara and and the cooler coast from west to Vic. SW WA NOT hot, again !! Cool anomalies in south exact opposite of prediction. Minimum temperature Outlook Map for July to September 2003 published by BoM 17 June 2003. Comments;Model on steroids, again ! overall warmth predicted. Observed minimum temperature anomalies for July to September 2003. Comments: No 1, real world is much closer to average overall. Some marks for Qld warmth . S WA NOT hot again !! S SA , Vic, NSW all cooler than model, Tas wrong again. Maximum temperature Outlook Map for June to August 2003 published by BoM 15 May 2003 Comments; Number 1, too damn warm overall. Why can not these guys see this overestimating ???? Time after time after time. 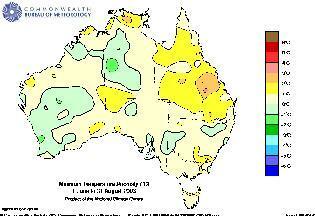 Observed maximum temperature anomalies for June to August 2003. Comments: The top end might score 55% but the rest not worth two bob. South WA not hot again !! Southern cooler fringe not picked in model. Minimum temperature Outlook Map for June to August 2003 published by BoM 15 May 2003 Comments;Once again, model on steroids, major overall warmth predicted. The model likes these dipoles. 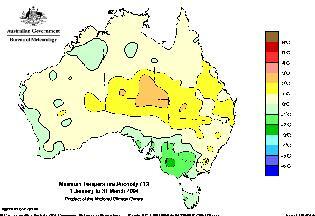 Observed minimum temperature anomalies for June to August 2003. Comments: Let's score Qld a 75%. Southern WA not HOT againshould be a minus 35%, the BoM would claim Tas, Vic & S SA a success and the rest not worth mentioning it is so wrong. Maximum temperature Outlook Map for May to July 2003 published by BoM 15 April 2003 Comments; The model likes these easterley plunging troughs. Observed maximum temperature anomalies for May to July 2003. Comments: How wrong can the BoM modelling be !!! But Hey ! they got Tasmania. 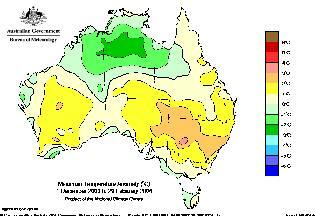 Minimum temperature Outlook Map for May to July 2003 published by BoM 15 April 2003 Comments;Once again, strong NS gradient in east. 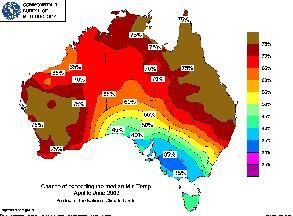 Maximum temperature Outlook Map for April to June 2003 published by BoM 18 March 2003. Comments; Plunging geosynclinal structure. Observed maximum temperature anomalies for April to June 2003. Comments: About a 55%. 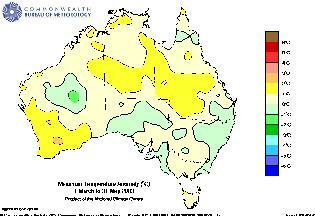 Minimum temperature Outlook Map for April to June 2003 published by BoM 18 March 2003. Comments;Model on steroids too hot, trough structure planges SSE. Observed minimum temperature anomalies for April to June 2003. Comments: Maybe some score for SE Qld but I do not see how the rest can rate. No sign of Vic SA predict cool. Tasmania wrong again. Maximum temperature Outlook Map for March to May 2003 published by BoM 18 February 2003 Comments; Synclinal structure, speaking geologically. Observed maximum temperature anomalies for March to May 2003. Comments: Fair result, about a 65%. Observed minimum temperature anomalies for March to May 2003. Comments: Apart from S WA is there any more than say 25% merit ?.